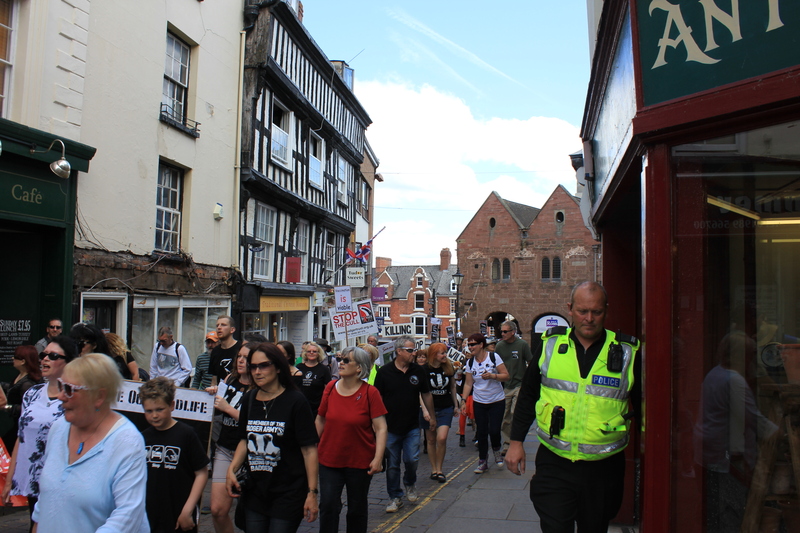 One of the key messages whilst on the march in Ross on Wye yesterday was we won’t give up. Even though the Tories have got back in and the next five years for wildlife look very bleak, we won’t give up. Later this year the badger cull will be rolled out again and they’re now looking at Dorset too, there are plans to repeal the Hunting Act, there’s game keepers calling for reduced protection of birds of prey so they can protect their pheasant and partridge shoots and then there’s the Government fighting the EU ban on neonicotinoids which have a terrible impact on bees. With all this and more going on it is really important we don’t give up and we show that. 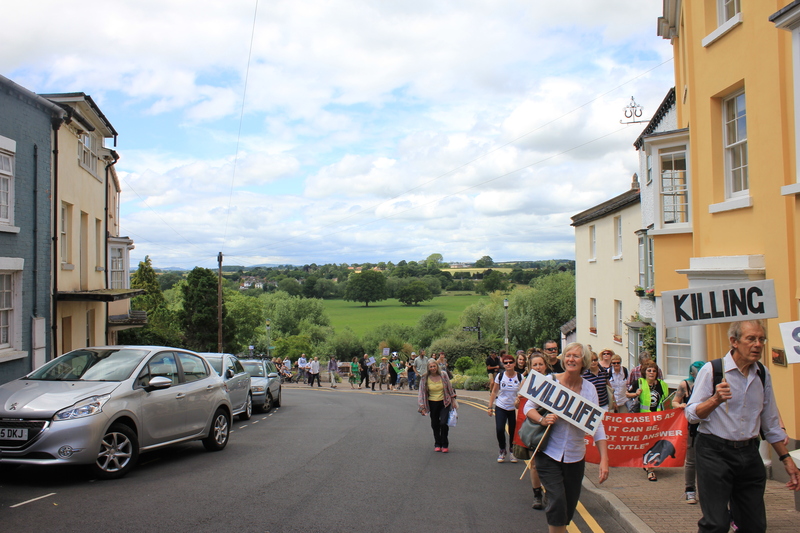 A few weeks back I heard about a stand up for wildlife march in Ross on Wye which was the first since the election. I’ve been to quite a few of these now. Not only do I enjoy going because I meet some great people and it’s always a good day but I think it’s really important to show your support and try and get that message heard loud and clear. 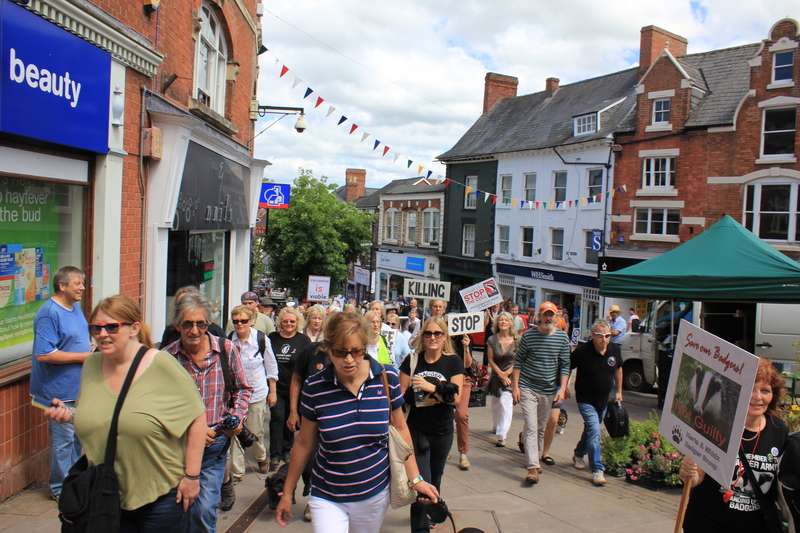 The march started at 12.30 and everyone gathered at the band stand in Ross on Wye. Altogether there was well over a hundred and as we went through Ross town centre the crowd seemed to grow. 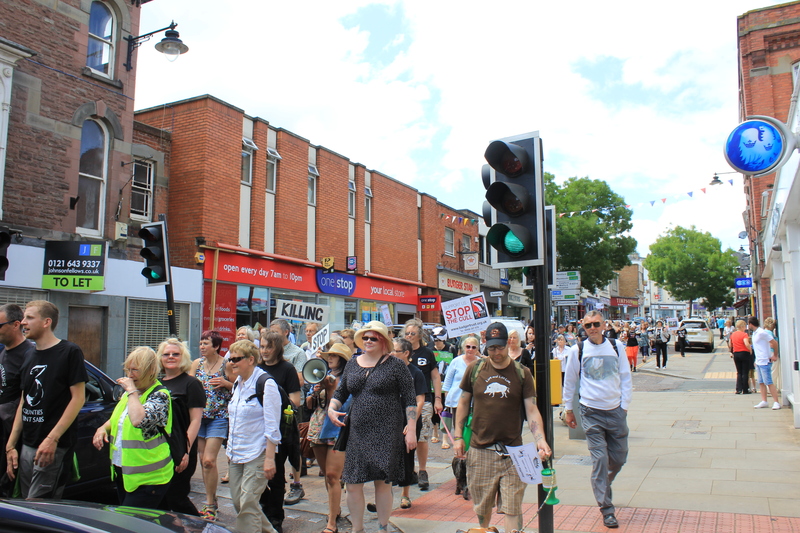 The march went up the high street and round by the market where it was very busy and lots of people shopping. This was good as there was more people to see and hear what we had to say. I find it fantastic how the whole street will just freeze as people stop to see what’s going on and the people working in shops come out too. 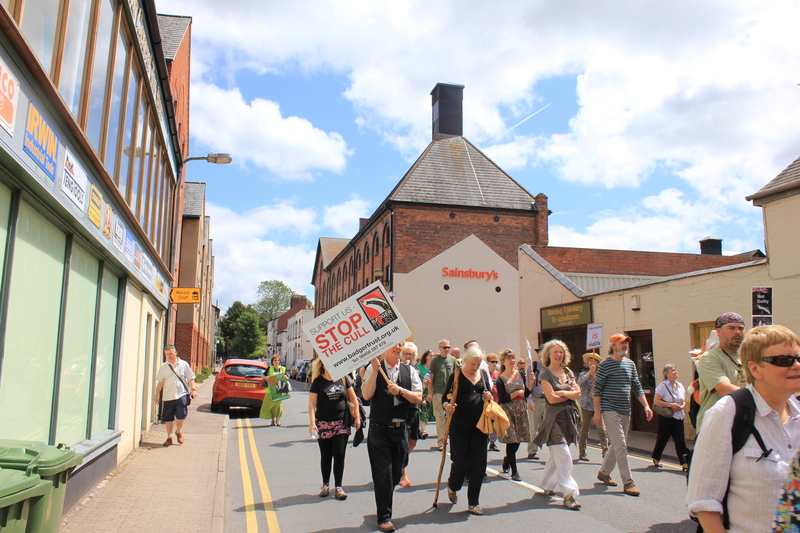 On our way round we stopping just outside Sainsbury’s for a few minutes, if you haven’t heard about Sainsbury’s click here, then we made our way to the top of the high street where Dominic Dyer (CEO Badger Trust) gave a few words. We then made our way back to the start before we created too much commotion in the town. Once back we gathered round for some talks. First to speak was the dairy farmer Steve Jones who spoke about how he’s dealt with bTb and how good biosecurity will stop bTb. His talk was very interesting and one that I really enjoyed. You can watch it by clicking on the link below. 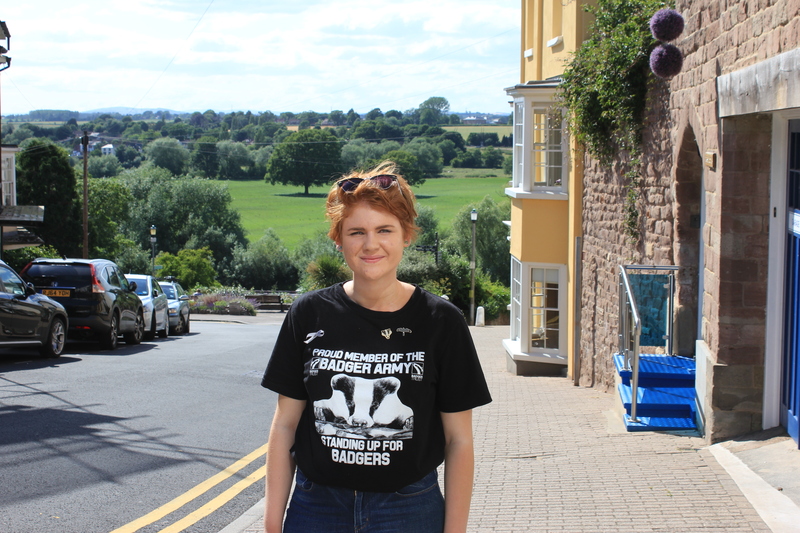 Next to speak was Tosca, Lynn Sawyer and Ray Pottock who all spoke about issues like badger culling and the Hunting Act along with all the amazing work which has been done in that area by Gloucestershire Badger Group, who organised the march, the Wounded Badger Patrol and Three Counties Hunt Sabs. Again these were all brilliant speeches and it was great to hear about the positives work that have gone on during this horrific time. Along with this though it also reminded you of the terrible things that are going on and inspire you even more to do your bit. 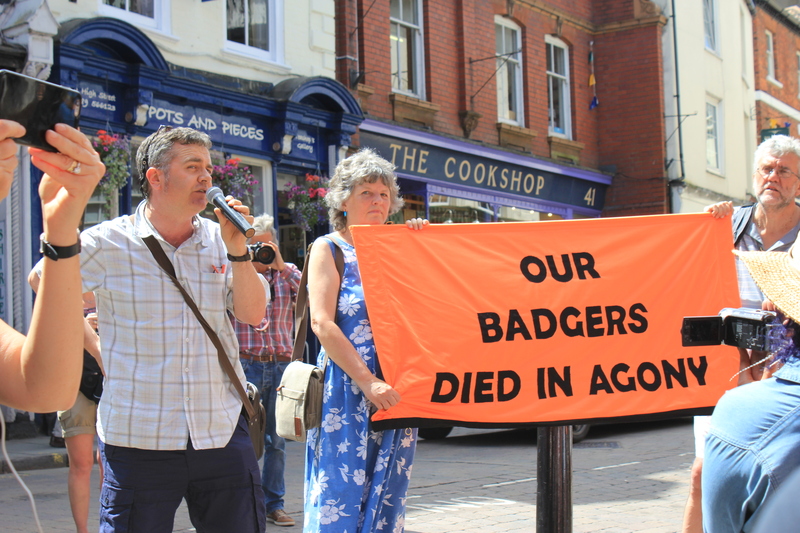 Last to speak was Dominic Dyer who gave, once again, a superb speech and finished the afternoons march off. All filmed by Dianne Bartlett. Thought this photo outside of Sainsbury’s was rather apt!